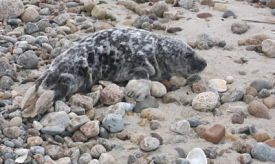 On March 28, SEANET volunteer Tom Grota was surveying Horseneck Beach, and came across this Gray Seal (Halichoerus gypus) pup up near the dune line. Gray seals are endemic to the North Atlantic, and are year-round residents in Buzzards Bay. Breeding populations occur in Chatham off Monomoy Island, and on Muskeget Island off Nantucket. Young are born in winter from late December to mid-February, and are known to wander great distances from their natal site. The area’s largest seal, males can reach up to 8 feet and can weigh over 900 pounds. The can stay submerged for nearly an hour. Grays are often called “Horseheads” due to their long snout. Harbor seals by comparison are somewhat migratory and more seasonal, with most breeding occurring north of Massachusetts. Seals feed on a variety of fish species. Seals became protected under the Marine Mammal Protection Act following years of bounties from conflict with the fishing industry, and have since have become highly abundant range-wide. While many seals hauled out (temporarily leaving the water for sites on land or ice between periods of foraging activity) along our shorelines from late fall to late spring are often considered sick or injured, this often isn’t the case. Hauling out is natural behavior when animals are resting. If a seal does appear obviously sick or injured, please call the Cape Cod Stranding Network at 508-743-9548 to report the animal.